Let’s face it, one of the most important tasks to perform in the morning is to put the kettle on for a tea or coffee. 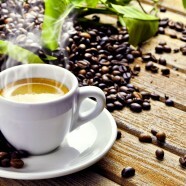 In the mornings our household is exclusively in the coffee camp and we really love our fresh coffee. 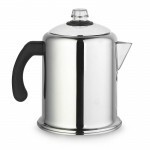 I’ve wanted a stove top coffee percolator for some time, but finding one that is big enough for everyone and is suitable for use in the caravan has proven quite tricky. However I did by chance find a great coffee pot in Lakeland. It makes up to 8 cups (and these are real cups, not expresso cup sizes) and is made from stainless steal. It works like this. You fill the pot with cold water, load the basket with coffee then insert this into the pot. Once you add the lid, bring to the boil leave it for 5 – 7 minutes (depending on how strong you like it) and just like that you have good, fresh coffee hot and ready for the family. We can use this pot either on the hot plate or the gas ring. It is really easy to clean too. Simply scoop the spent coffee out and wash everything in soapy water. Turning the hot plate on low means we can keep the coffee warm and ready for when anyone wants a top up. We’ve used this pot now a couple of times and our overall opinion on this pot is excellent. Its very easy to use, easy to clean and genuinely makes enough coffee in one go for the whole family. For the children who enjoy milky coffee we also purchased an aerolatte milk foamer to create some latte or cappuccino type drinks.